In a cooperative group effort, Colorado animal rescuers are handling the big job of removal and placement for 161 cats living with a Colorado Springs woman who is moving and unable to take the cats with her. According to news reports, the cats appear to be well socialized, healthy and well cared for, and were housed in large kennels in the woman’s house and garage. The rescue operation came about by chance when Laura Lampley, a volunteer with Denver-based Colorado Animal Welfare League, spent two days in the hospital following a cat bite. Bored, Laura was browsing Craigslist when she saw a listing titled ‘Cats in need of homes.’ Laura guessed the number might be 15 or 20 and was taken aback to find the actual number of cats to be in excess of 150. The online post was placed by a friend of the woman keeping the cats. Laura contacted the friend, discovered the magnitude of the situation, and set to work calling in help. Life Is Better Rescue came out from Lakewood with a large van to take the cats from the home. The cats were distributed among 13 area rescues. Organizations helping out include, Wild Blue Animal Rescue and Happy Cats Haven both of Colorado Springs, Pet Project of Pueblo, Life is Better Rescue of Lakewood, Every Creature Counts of Fort Lupton and Almost Home Adoptions of Westminster. Carolyn Spillner, who went into the home, said “A lot of the cats, you could tell, had been socialized. A lot of the cats were with her all the time. No feral cats, which was good.” A sample group was tested as part of the initial wellness assessment, and all were negative for FIV and FeLV. Rescuers say the move will be stressful for the cats, but they are expected to be ready for adoption in a week or so. Expenses for the cats’ rescue and care are expected to run into the thousands. The participating organizations are accepting donations to help meet those costs. The woman who had the cats is not under investigation or being charged with any offenses. One of her stipulations in handing over the cats was that her name and location be kept private. Last month I read about a man who was convicted of the maiming, torture and killing of cats- many of which he found advertised on Craigslist. PLEASE don’t use these kinds of sites for re-homing ANY animal. Serial torturers of animals (including dog fighters who use these pets as bait) love these sites because they can obtain animals for little or nothing. I was there, I personally caught by hand most of the 161 cats. This WAS a hoarding situation. Sure, I could have been worse,we did not find dead cats, but those cats were extremely crowded and so mentally understimulated that when a towel dropped on the floor, about 10 of them instantly pounced on it and began playing with it, just so excited to have something to play with! Imagine, just imagine a 10×20 cage made of chicken wire holding 150 unfixed cats! Constant fighting, females being raped multiple times by multiple males, unable to escape being attacked. Most of the cats were dehydrated, ALL of them had severe earmite infections. The smell alone would have sent most people running! One of the reasons there weren’t any kittens is possibly because they were so overcrowded that they were eating any newborns. This was a SAD and DESPERATE situation. These cats were not rescued from the streets by this woman, they were all related, litter after litter being born! She started with just 6 cats. Do I feel for her? YES, because she cares tremendously, but is mentally ill and could not see how much they were suffering. Just wanted to clarify that this WAS NOT a healthy environment and these cats are lucky to have survived and ended up with no-kill groups! We have an awesome community of cat lovers in Colorado! Angela Bryan, thank you for the clarification! I guess it WAS A LOT WORSE than the story first suggests. At least they’ll receive proper care now. Did you see my post a couple days after your most informative one? Who was this woman? And did anyone you know of report her to any authorities? I heard she may have kept some kittens. If that’s true you know for sure there will be 160 more in 3 years, living just like these were. Yes in an rv. In tv smell is horrid. I sincerely acknowlege all the time and hard work of all the people involved in rescuing these kitties. AND I also ask the question: Does anyone really believe that there won’t be another 160 cats in this womans house three years from now if her identity is forever hidden? Why? Because like most or all hoarders she has an untreated illness; her family and those who know her protect and hide her; and because somehow, at least according to the story as reported, she negotiates an agreement to remain annonymous. Out of all the rescuers who now know who she is and where she lives, I appeal to the consciences of each one of you to expose her, and to report her to those who might be able to monitor this woman and prevent an identical situation from developing in the future at the hands of the same woman with the same unaddressed illness. 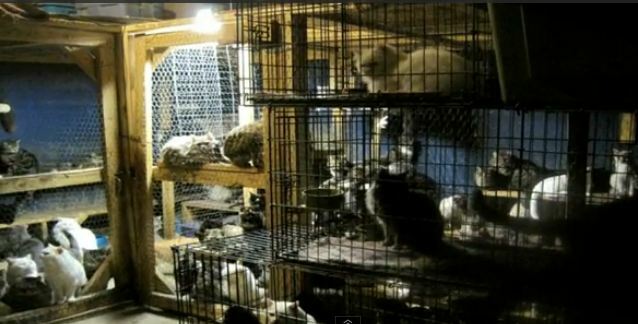 If no one comes forth and discloses her to the authorities there will be NO consequences, No deterrent, No oversite, NO help, to keep her from repeating what she’s just done – to the huge detriment of another 160 cats. It’s one thing to help our dependent and mistreated little ones. It’s another to be a part of it’s guaranteed repeat. Amen I believe they were very decieved by this woman she stops her car in middle of the road if she feels that there’s a kitten close. She runs and hides if someone calls or she feels a call has been made. There is always going to be sorrow in this world, and it is difficult to say which path is best to follow……because no path will have the best answer. You reveal this woman, and it causes other hoarders to go underground. You don’t reveal this woman and you save 167 cats….. maybe she learns from her mistake and gets help, or she repeats the tragedy. In the end, we can only do a little good in our corner of the world. You can play the Judge, but it doesn’t really help anyone or any creature. I thank the people who try to do good in a messed up world. Actions toward good, are much better than words and critism. No she still moved away and makes others human beings live with the NASTY smells, and because where shes at there’s nothing much to be done, she just moved and keeps moving and untill she’s caught or saddly passes away from the damages she’s causing herself, don’t forget shes already ILL and now won’t leave her cats to stay in the hospital BECAUSE her cats were removed while she was in hospital in Colorado. In R.v. park in Texas she won’t tell how many cats but, you can not walk passed her place without the amonia smells poring out; if this is one from 5dr home in coroldo springs. This is a dishearting thing you’ve done Coroldo, she NEEDED more from you as your citizen you should have taken care of her. Were you eating her CAT NIP? Where is she now, Donna?